Monday, April 4, 2016, was Square Root Day, because the date is abbreviated 4/4/16, and 4 × 4 = 16. But if you’re a faithful reader of this blog, then you already knew that, because you read all about it in Monday’s post, Guess the Graph on Square Root Day. But it doesn’t end there. It ain’t just one day. Oh, no, friends… this is a banner week. Or, really, a banner two weeks. Tomorrow, April 8, 2016, is a geometric sequence day, because the date is 4/8/16, and 4 × 2 = 8, and 8 × 2 = 16. And then Sunday, April 10, 2016, is an arithmetic sequence day, because 4, 10, and 16 have a common difference of 6. Though honestly, arithmetic sequence days are a dime a half-dozen; there are six of them this year. Next Monday, April 12, 2016, is a sum day, because 4 + 12 = 16. Again, ho-hum. There are a dozen sum days this year, and there will be a dozen sum days every year through 2031. And just a little further in the future is Friday, April 16, 2016, whose abbreviation is 4/16/16, and if you remove those unsightly slashes, you get 41,616 = 2042. I’m not sure what you’d call such a day, other than awesome. Admittedly, some of those things are fairly common occurrences. But, still. That’s six calendar-related phenomena in a thirteen-day period, which may be enough mathematic-temporal mayhem to unseat the previously unrivaled Mathiest Week of 2013. Partially, this blog post was meant to enlighten and entertain you. But mostly, it was meant to send numerologists off the deep end. Mission. Accomplished. Did you hear about the two grad students who stole a calendar? They each got six months! I was going to look for my missing calendar, but I just couldn’t find the time. Today is 11/12/13, a rather pleasant-sounding date because the numbers form an arithmetic sequence, albeit a trivial one. 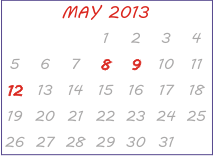 It’s not the only date in 2013 for which the month, date, and year form an arithmetic sequence. How many others are there? Several nights ago, my sons asked if they could do bedtime math, but Eli asked if we could do problems other than those on the Bedtime Math website, because “they’re a little too easy.” So instead, I navigated to the MathCounts website and opened the 2013-14 MathCounts School Handbook. We scrolled to page 9 and attacked the problems in Warm-Up 1. The angles of a triangle form an arithmetic progression, and the smallest angle is 42°. What is the degree measure of the largest angle of the triangle? An arithmetic progression is a sequence of numbers for which there is a common difference between terms. But such a definition isn’t very helpful, since I’m not sure that either Eli or Alex know what sequence, common difference, or term mean. It would have led to even more questions. Plus, I’ve always believed that kids understand (and retain) more when they discover things on their own. Call it “discovery learning” or “inquiry-based instruction” or any of myriad other names from educational jargon, it just means that giving kids the answer is not the most effective way for them to learn. And there you have it. Three examples, and my sons were able to define arithmetic progression. It’s not as sophisticated as “a common difference between terms,” but “add the same amount every time” is a sufficient definition for a six-year-old. Eli said, “I don’t fink vat’s enough.” When asked to explain, he said he thought that the angles in a triangle add up to 180 degrees. “Are you sure?” I asked. He wasn’t. Nor was Alex. So I asked if they could convince themselves that the sum of the angles is 180°. And again they concluded that each triangle would have a sum of 180°. Understand, this is NOT a proof of the triangle sum formula. When they get to high school and need to demonstrate the rigor that the Common Core State Standards are demanding, well, then we’ll worry about formal proof. But for now, I’m okay with six-year-olds who can demonstrate that kind of reasoning. They concluded that the largest angle had a measure of 78°. And all was right with the world. Partially, it’s because I’m a proud father. But more importantly, it’s because this vignette demonstrates that teaching is an art, and successful teaching doesn’t happen by accident. It’s not easy, as many people believe. What’s easy is the perpetuation of bad teaching, a la Charlie Brown’s teacher, or textbooks that simply present information with the belief that students will absorb it by osmosis. Good teaching, however, requires content knowledge and pedagogical knowledge, and it demands teachers who can handle unexpected classroom twists and turns and have the ability to adjust on the fly. Students think that 16/64 = 1/4 because you can “cancel the 6’s”? Uh-oh. Better find some counterexamples pronto, and help them understand why 16/64 can be reduced to 1/4. Your students don’t know the definition of arithmetic progression? Then you better figure out a way to help them define it, and just writing your definition on the chalkboard isn’t gonna cut it. Want to see what good teaching looks like? See Dan Meyer, or Christopher Danielson, or Fawn Nguyen. Or many, many others who don’t blog about it but inspire students every day. Someday soon, I hope to add my project at Discovery Education to the list of examples of good teaching. Until then, I’ll just keep blathering about my sons. I’ve been reading a lot recently. And not just math books. In fact, I just finished reading a book on antigravity — I couldn’t put it down. The four branches of arithmetic are ambition, distraction, uglification, and derision. Winnie the Pooh and Piglet receive a box from Eeyore. In the box are 10 sweets and a note. The note says that they are to divide the sweets evenly — 7 for Pooh, and 7 for Piglet. “How is that possible?” asks Piglet. What is Winnie the Pooh’s favorite math subject? The month, date and year are consecutive terms in the Fibonacci sequence. The numbers form an arithmetic sequence. Arithmetic sequence dates are a dime a dozen. In fact, there are six of them in 2013 alone. Pythagorean dates and Fibonacci dates are far more rare. There are only eight Pythagorean dates and six Fibonacci dates in the entire 21st century. To have all of them occur within a six-day span is incredible. The median age of the Reader’s Digest audience is 53.5, and 60% of their audience is female. So if I admitted to you that I’m a regular reader of the magazine, it’d be reasonable for you to assume that I’m an elderly woman. I am not an expert in early childhood education, so when I was asked to give a presentation at the National Head Start Conference, I had to find a way to establish credibility. I told the audience, “Though I’m not trained as a pre-school teacher, I currently have a pre-school classroom with two students.” I then showed a picture of my twin sons. Did it establish credibility? I’m not sure. But it was enough to encourage a mother of twins to share some advice with me. “The best thing we ever did,” she said, “was use even and odd days. One kid got to choose on even days, the other kid got to choose on odd days.” This struck me as sheer brilliance. At the time, my wife and I had a series charts to keep track of whose turn it was: one for who got the Mickey Mouse plate at dinner; one for who got to sit on the passenger side in the car; one for who got to go first when we played Chutes and Ladders; and another fifteen or so for other minutia. It was driving me batty, so this suggestion was a game-changer. Good point. We decided that the 31st would be mommy and daddy’s day to choose (and in leap years, we’d also claim February 29). This system worked well, even at bath time, when both boys wanted to sit near the front of the tub to have access to the spigots. Since they took baths every third day, the odd/even system was just fine. Until recently. Allowing the 31st to be mommy and daddy’s day to choose doesn’t fully solve the problem. Plus, it smacks of favoritism when a parent chooses one child over the other (for anything). Uh-oh. I feared that a new chart would be created, and we’d be returned to the bleakness we knew before the even/odd system had been implemented. Luckily, I was able to devise a new system, and in the process I taught Alex and Eli about modular arithmetic. As a family, we created the chart shown below. The columns indicate those numbers that are congruent to 1, 2, 3, and 0 modulo 4. 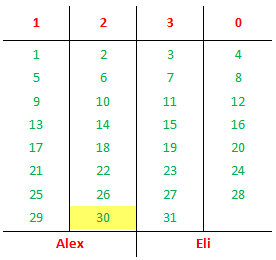 As shown, Alex would get the choice on days congruent to 1 or 2 mod 4, and Eli would get the choice on days congruent to 3 or 0 mod 4. But as you can see, this system still unfairly benefits Alex. The solution? Alex does not get the choice if a bath occurs on the 30th of a 31-day month. On those days, I suggested that a coin toss would be used to determine who gets the choice. “If it’s heads, Alex gets the choice; if it’s tails, Eli gets the choice,” I said. Both boys seemed uncomfortable with this. For some reason, they inherently distrust coin tosses. So we agreed that we would roll a die instead. “If the roll is even, Alex gets the choice; if it’s odd, Eli gets the choice,” I suggested. Such is life in a house with mathematical twins. Everything is a debate. I’m just thankful that it’s a debate about numbers and not about eating broccoli. Teacher: If I give you two dogs and then give you two more dogs, how many dogs will you have? Teacher: Not quite. Try again. If I give you two dogs and then give you two more dogs, how many dogs will you have? Teacher: Hmm, no. Let’s try this another way. If I give you two cats and then give you two more cats, how many cats will you have? Teacher: Excellent! So, if I give you two dogs and then give you two more dogs, how many dogs will you have? Teacher: I don’t understand! Why do you say that if I give you two cats and then two more cats, you’ll have four, but if I give you two dogs and then two more dogs, you’ll have five? Johnny: Because we’ve got a dog at home! My colleagues and I used to joke about the LCS teaching method. Don’t be embarassed if you’re a veteran teacher but have never heard of this method before. We made it up. The acronym LCS stands for Louder, Closer, Slower. There was, unfortunately, one teacher in our school who, if a student didn’t understand an explanation, would say the exact same thing over and over… but each time would move closer to the child, say the words in a louder voice, and speak more slowly. It was difficult to watch these interactions. With each repetition of the explanation, the teacher would get more and more frustrated. Sadly, the student would get further frustrated, too, but the teacher would never notice! It was like watching an American tourist in France ask for directions! Because it is his mission.